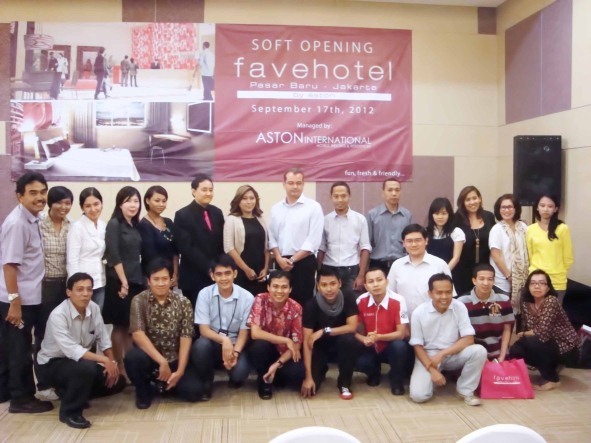 Jakarta - September 17th, 2012 – Aston International opened its third trendy select service favehotel in Jakarta, the favehotel Pasar Baru. The new “fave” occupies a strategic location on Jalan Pasar Baru in the immediate vicinity of Jakarta’s China Town, the Mangga Dua trade complex and many main government offices. With 84 fun, fresh and friendly rooms the new favehotel Pasar Baru aims to become the area’s best in class select service hotel. Guest rooms are equipped with LED televisions, top of the line beds with quality cotton bed linens and duvets, free and “truly” high speed WiFi and a complete set of complimentary in room amenities such as fluffy cotton towels, bathroom amenities, individual controlled air-conditioning and save deposit boxes. Snapshot of Press Conference Soft Opening favehotel Pasar Baru, seen in the image (center to left) Mr. Norbert Vas – VP Sales & Marketing Aston International, Ms. Fridi Harini – Corporate Sales & Marketing Director fave & NEO of Aston International, Mr. Abdurrachman Sumantri – Hotel Manager favehotel Pasar Baru and Ms. Febry M. Anindita – Corporate Marketing Communications Manager Aston International (third from far right) together with Jakarta’s media. Snapshot Soft Opening Ceremony favehotel Pasar Baru, seen in the image Wine Toasting as an official sign of Soft Opening favehotel pasar Baru by (left to right) Mr. Sujoyo Hartawan – Owner of favehotel Pasar Baru, Ms. Fridi Harini - Corporate Sales & Marketing Director fave & NEO of Aston International, Mr. Abujadi Hartawan – Owner of favehotel Pasar Baru, Mr. Norbert Vas – VP Sales & Marketing Aston International and Mr. Abdurrachman Sumantri – Hotel Manager favehotel Pasar Baru. favehotels currently operates thirteenth (13) hotels in Indonesia and Malaysia and has a large development pipeline counting more than fifty 50 hotels. favehotels aims to be SE Asia’s best in class and most consistent budget hotel chain promising uncompromising standards for cleanliness and safety and select hallmark services and facilities including top of the line beddings, an industry leading website and booking engine guaranteeing best rates for direct clients and fast and complimentary WiFi. Aston International entered Southeast Asia over a decade ago and has since become a prominent international player in the Indonesian hotel market, with offices in Bali, Jakarta and Surabaya. Archipelago currently operate in Indonesia, Malaysia and the Philippines under the five-star Grand Aston and Crimson, deluxe villa Royal Kamuela and Kamuela, four-star Aston, three star Aston City, Quest and Neo , boutique budget class Neo hotels and select service favehotel labels.